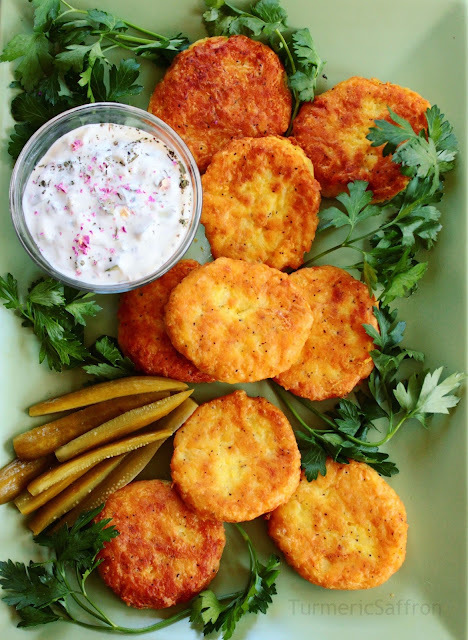 I serve these delicious potato patties (kookoo sib zamini) either as a side dish or as a main dish for a light lunch or dinner. 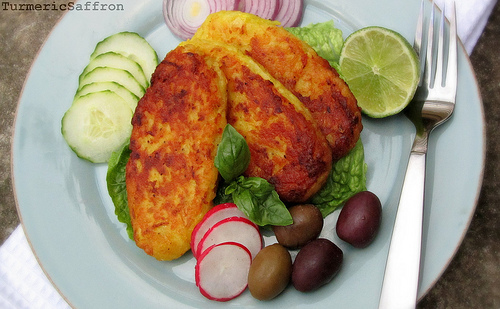 Fried vegetable and egg dishes are called kookoo/kuku in Iran. There are different variations of this recipe. 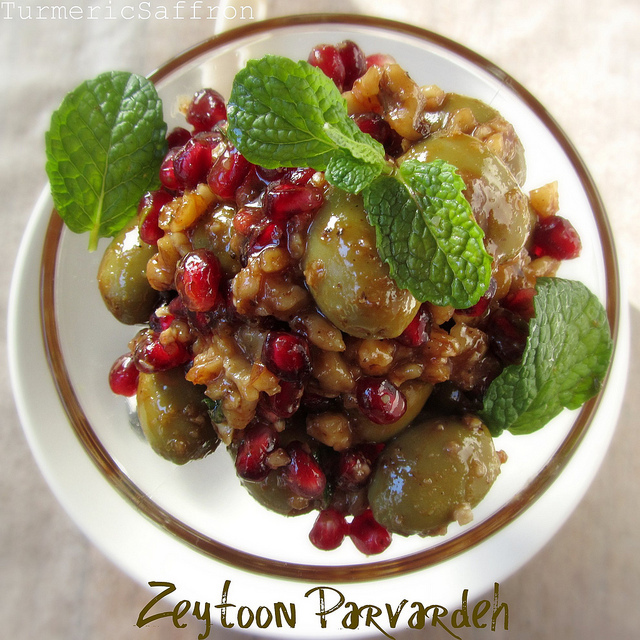 کوکوسیب زمینی (Kookoo Sib Zamini) is a great dish to bring to your next picnic! Place potatoes in a large pot, add water to cover by a couple of inches, boil on medium-high heat until tender. Drain and set aside to cool. Beat the eggs in a large mixing bowl, add grated potatoes, onions, turmeric, flour, salt and pepper. Mix all ingredients well. Set aside for 15-20 minutes. Make small patties, flatten them in an oval or round shape. You can also spoon the potato mixture into the oil. Heat 5-6 tablespoons oil in a large skillet over medium-high heat. Fry potato patties on both sides until golden brown. 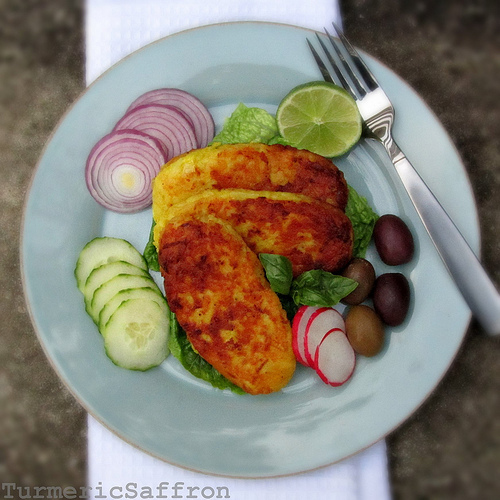 Serve with fresh herbs, pickles, olives, yogurt and warm bread. Thanks Azita. I was wondering if I should add the onion or not. I found it here. By the way wouldn't five eggs in 2pound of potatos make the mixture too sloppy? Probably depends on the size of your eggs, and the size of your potatoes! Looks yummy! My father used to make something similar to this, but I think he would shred the raw potatoes and then squeeze the moisture out of them using a dish towel. Is this method common or was he just doing things his way? Hi Neima, this is not a common/traditional method of preparing Kookoo sibzamini. However, it's an easy and quick cooking/preparation method. No, I haven't tried that yet but I'm sure that you can bake them in the oven.